Chinese da ma (literally meaning “big mamas”) are budget-savvy shoppers who are eager to snap up a good deal. They do most of the shopping for the family and know just the place to score bargain prices on everyday items. 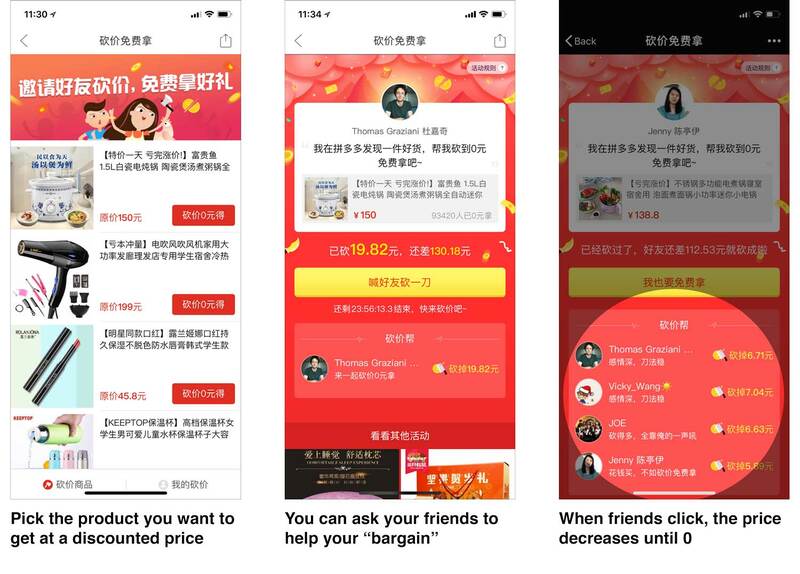 But these discounts come with one condition: whip up enough friends on WeChat to order the items in bulk, directly from the manufacturer. After all, the deal is so good that it deserves a spot on everyone’s Moments (the equivalent of Facebook’s news feed). The place to find these kinds of deals is Pinduoduo, a leading Chinese app for social ecommerce and the fastest growing app in the history of Chinese internet. How fast is Pinduoduo growing? Pinduoduo has seen explosive growth since its launch in 2015, becoming one of the largest ecommerce apps in China. The shop-with-friends app combines a group-buying strategy with cheap products and social media. It is now the fastest growing ecommerce platform with 13.85 percent YoY growth. 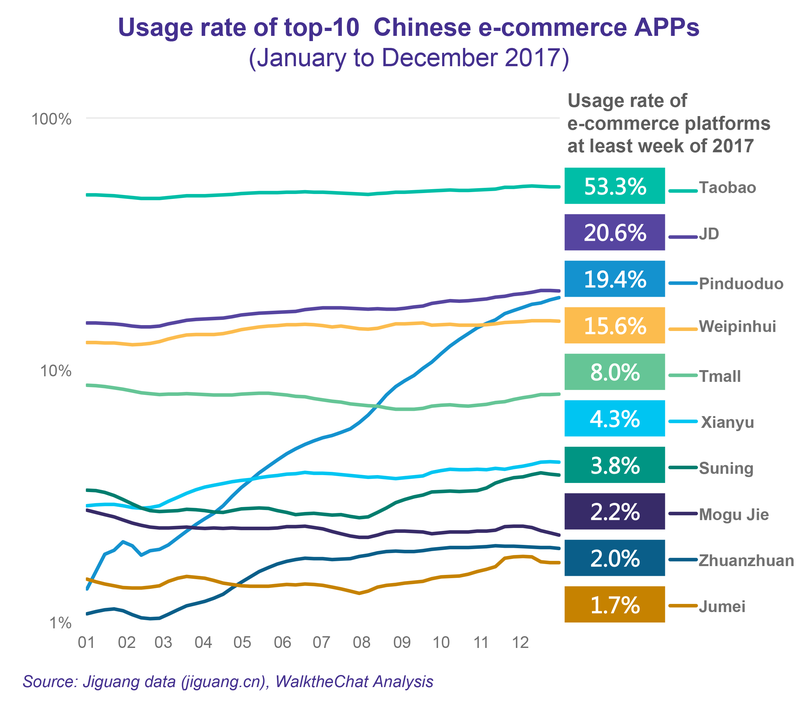 The usage rate of the platform among Chinese internet users has grown from under 2 percent to 19.4 percent over the course of 2018 (this leaves it right behind JD at 20.6 percent, but still far behind Taobao with a 53.3 percent usage rate). Pinduoduo also benefits from the best retention rate (seven days after installation) from all Chinese ecommerce platforms. 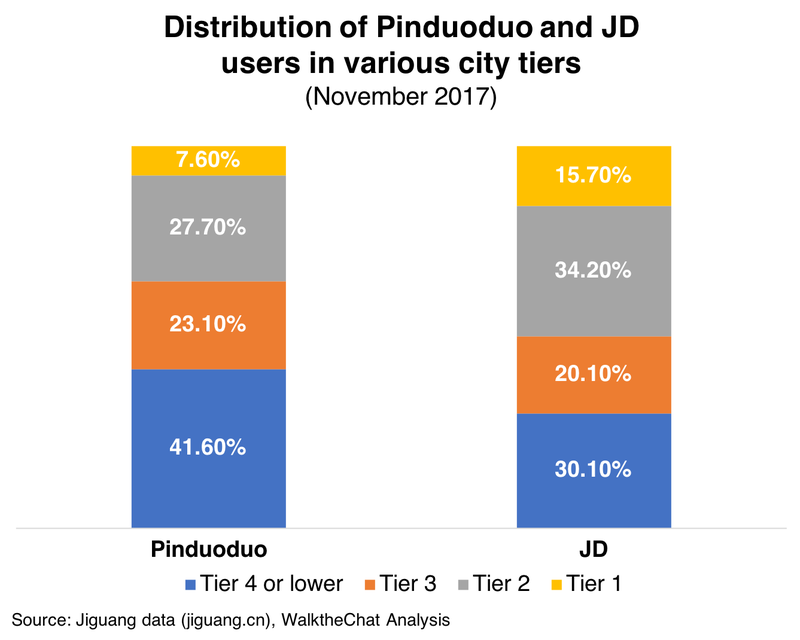 Users changing phones are, however, more likely to install Taobao or JD than Pinduoduo. 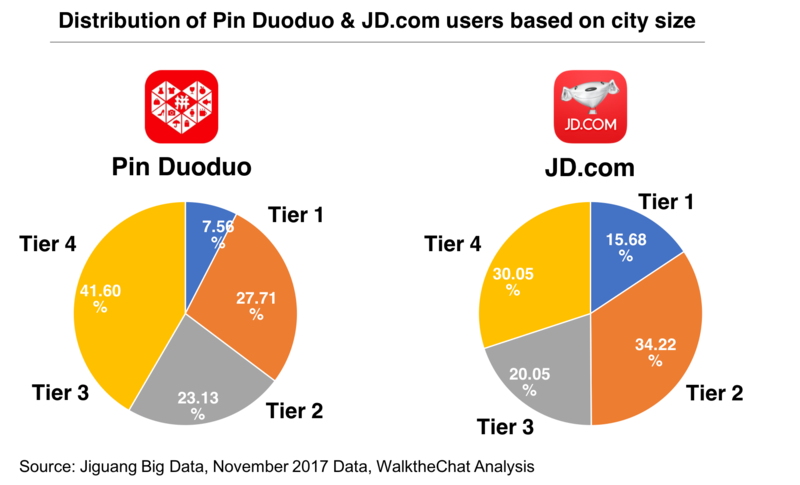 The company reported having 114 million active users in January 2018 and is behind only Taobao (425 million) and JD (145 million). It boasts a 300 million-strong user base, with 65 percent of its users coming from third-tier cities and beyond. In fact, a large proportion of their users are female, above 40 years old, and living in smaller Chinese cities. The lure of Pinduoduo is not just the incredibly low prices but the satisfaction of getting a good deal and scoring massive discounts. This hit home with the low-income segment in China’s more remote towns and villages. As ecommerce giants competed for affluent customers in urban areas, Pinduoduo focused on sourcing fresh produce from local growers to build an initial user base. The platform scaled quickly and has since expanded their product range to include household items like groceries, fashion, beauty, and electronics. 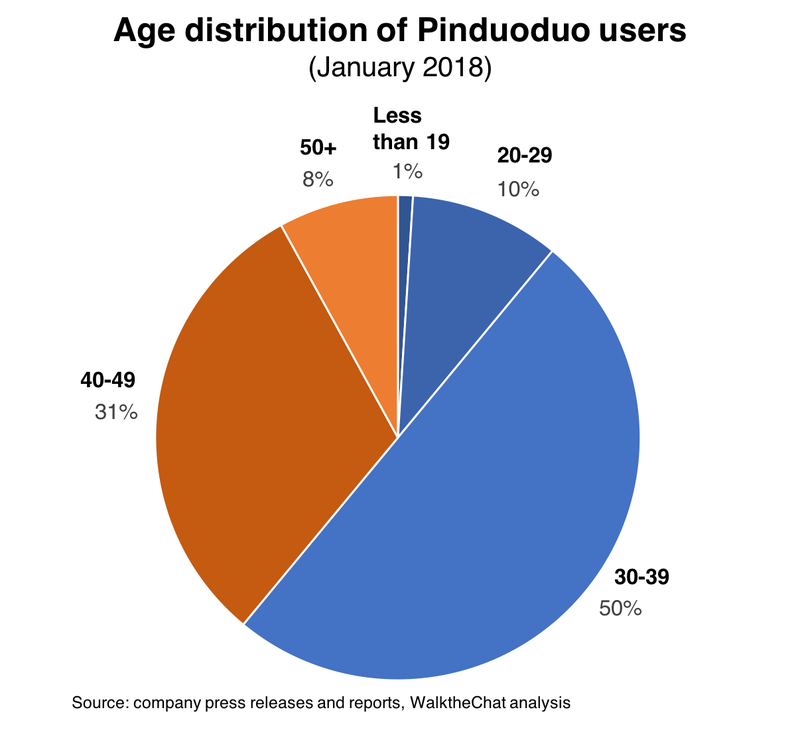 Pinduoduo introduces a new demographic of social shoppers to China’s world of ecommerce. The company claims that over the course of two years, about 1,000 factories have opened to sell on the platform. Focusing on producing just a few items in colossal quantities, these “pin factories” (拼工厂) are able to achieve and handle order volumes that have grown exponentially. 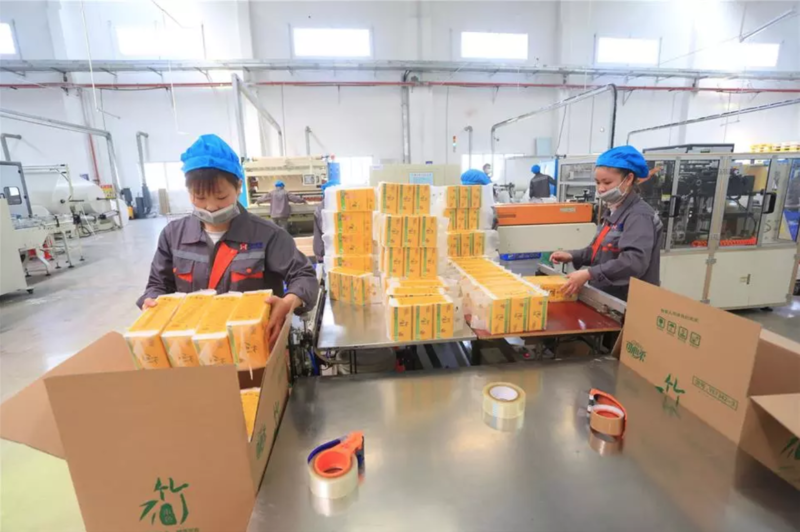 An example is Chinese tissue manufacturer CoRou and ZhiHu (also known as Botare), whose factories have collectively completed more than 9.3 million Pinduoduo orders. The sheer volume of each group order leaves sellers more room to cut prices, and the incredibly cheap prices attract even more customers, creating a positive ecommerce cycle. But as one might accurately assume, Pinduoduo is not known for quality. 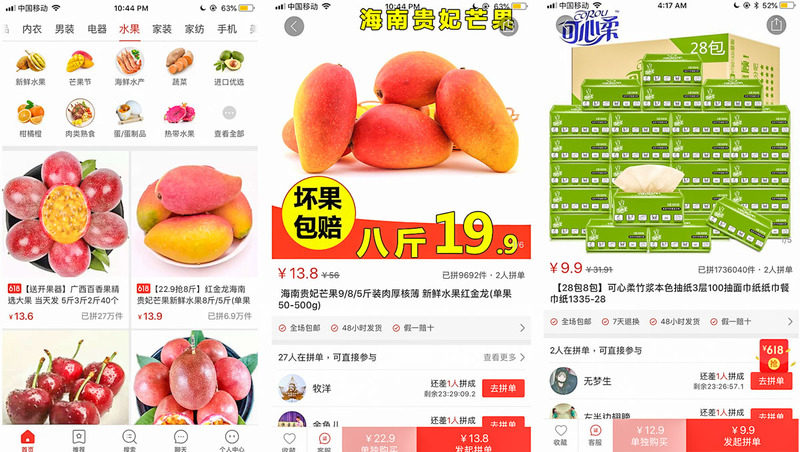 Last year alone, the platform took down 10 million “problematic listings” and set up a RMB 150 million fund (roughly US$22.4 million) to compensate users for shoddy goods, rotten fruits, and difficulties in getting refunds. A de facto substitute for Taobao? 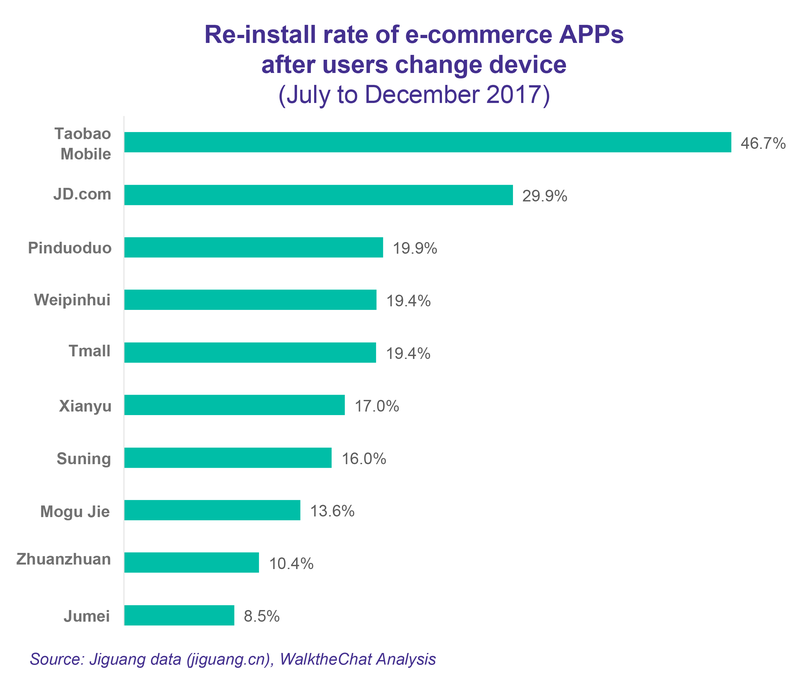 A subtle relationship exists between Pinduoduo and Taobao: 50 percent of the users that uninstalled the latter installed the former a month later. 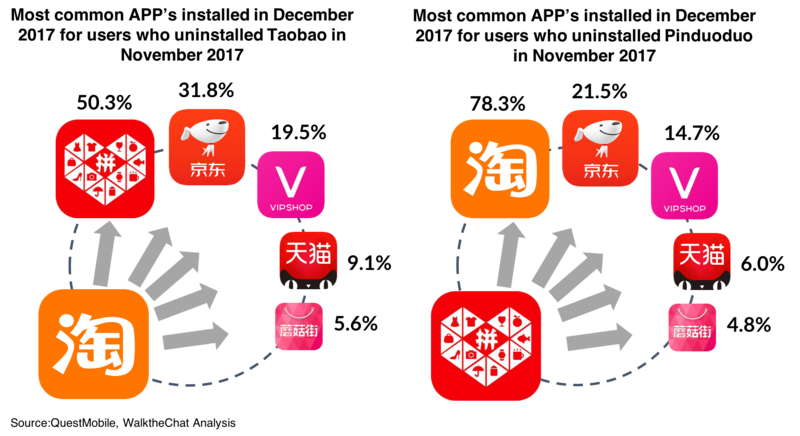 Pinduoduo is by far the most common substitute for Taobao. 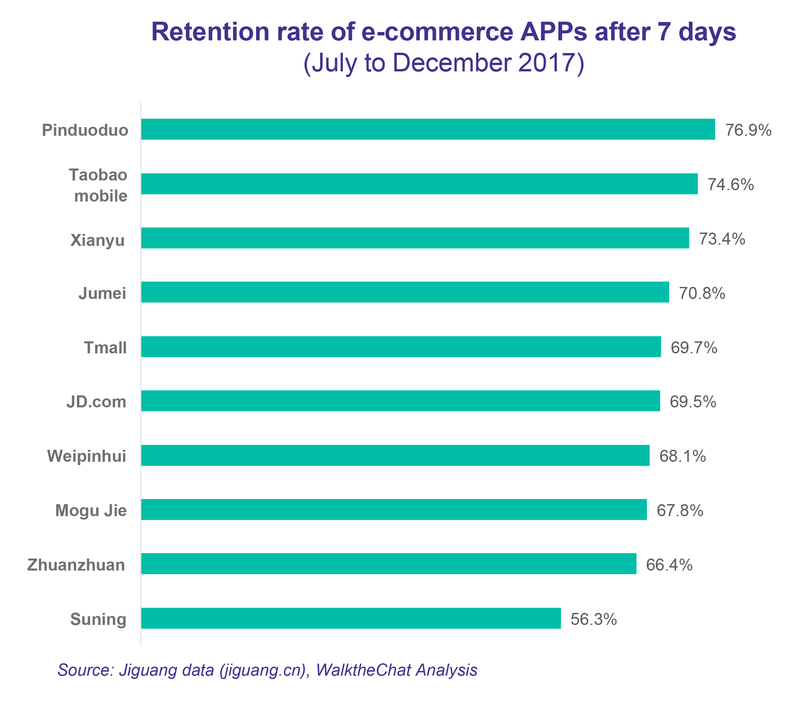 On the other hand, 78 percent of the Pinduoduo uninstalls are followed by Taobao app downloads in the following month, according to QuestMobile’s November and December 2017 data. Taobao is still leading the fight. There are two words that come to mind when thinking of Pinduoduo: addictive and viral. And the app combines a bunch of tactics to achieve these results. The core function of the app is group buying (each item has an official price and a group-buy discounted price). In order to get the discounted price, people will need to find friends to join the group-buy deal. The app offers a range of products for free. You just have to get enough new users to follow the Pinduoduo official account, install the app, and sign up via WeChat. One app install will get you a small box of candy, for example. I wanted to try this, so I went for the promotion that will get me a 1.3kg bag of nuts for nine app installs. This can sound like a crazy strategy, but it’s not. The package sells for RMB 99 full price and RMB 79 in group buying. 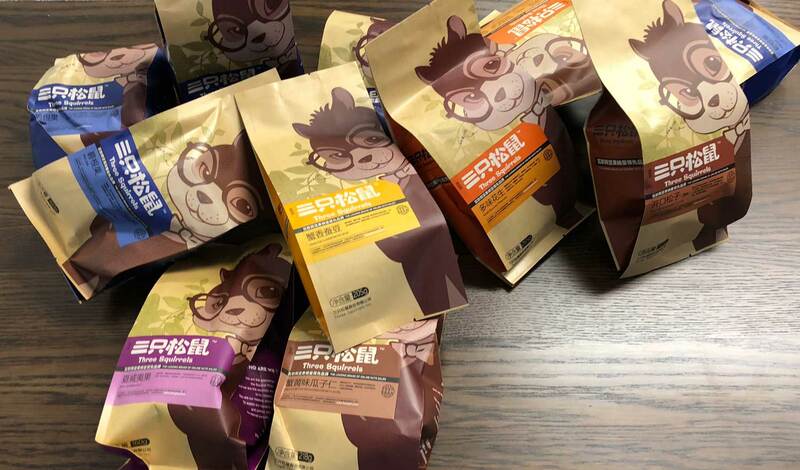 But Three Squirrels (the brand that makes the nuts) makes a heavy margin on this, and most likely only charges Pinduoduo around RMB 20 to 30 to ship the free product. 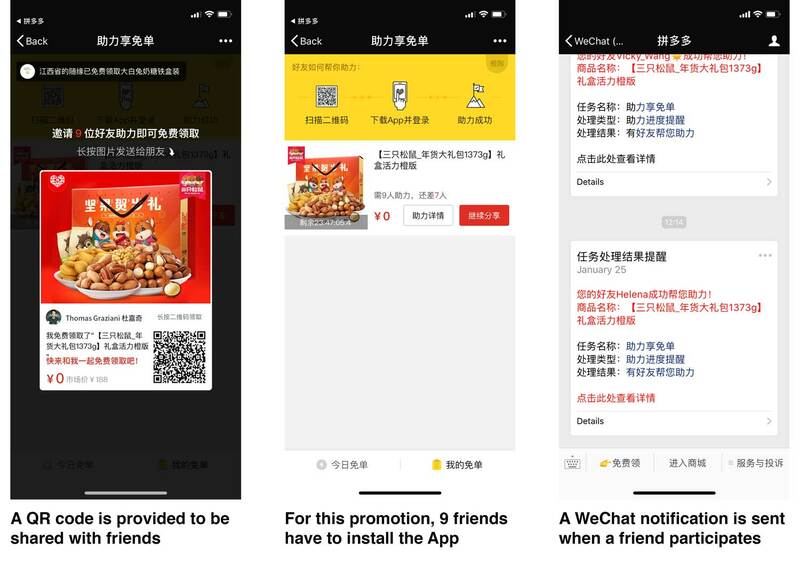 That’s RMB 3 per high-quality app install linked with a WeChat social account. This is exactly the kind of strategy that propelled Pinduoduo onto the top of the app stores. 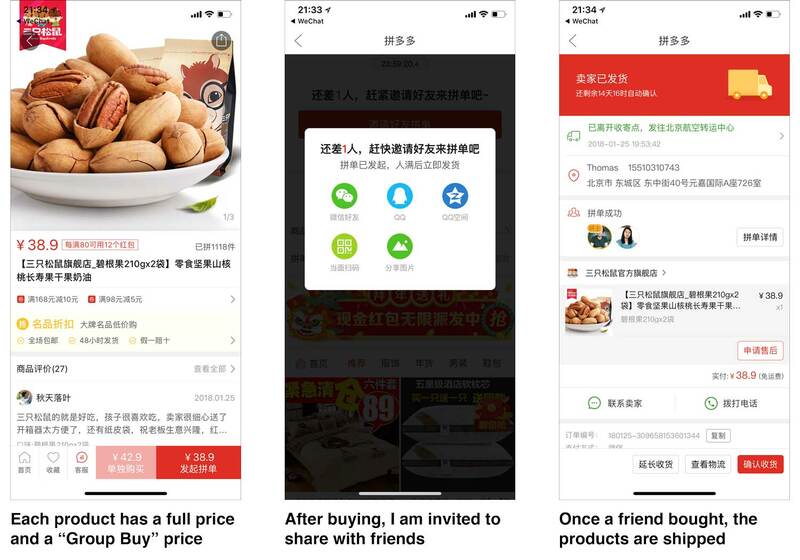 Pinduoduo offers coupons, which is nothing special in China. However, the company’s coupons have exceptionally short durations: usually only two hours. The message is clear: don’t linger around or hesitate. Another way Pinduoduo creates viral incentives is by asking friends to help “bargain” for a cheaper price. It works like this: You can share a product with friends, and each time a friend volunteers to help you bargain, the price decreases a bit. Eventually, you can get the product for free. This trick may seem costly, but it can be worthwhile for brands. Using cash/red envelopes to reward users for inviting friends is another old trick of viral marketing. 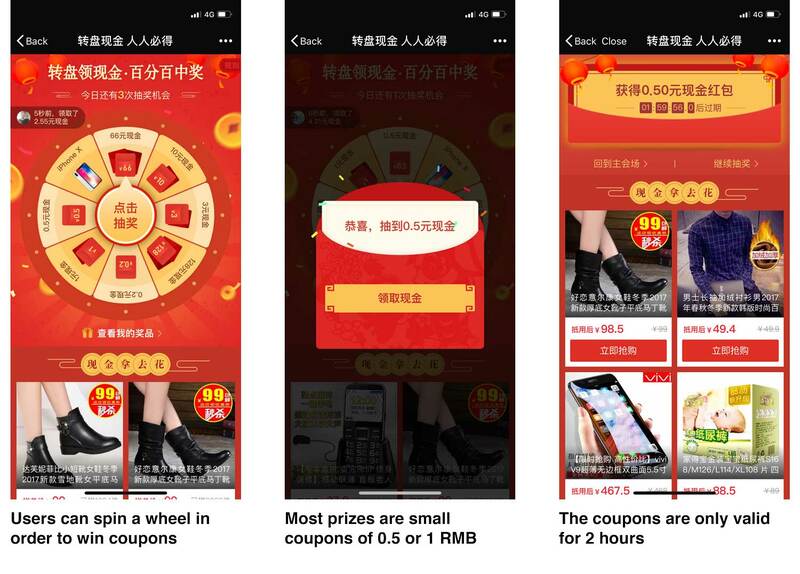 Pinduoduo rewards users a cash red envelope between RMB 5 to RMB 20 (US$0.75 to US$3). But Pinduoduo takes it a step further. Not only do they reward users but also display a leaderboard of the users who made the most money from inviting friends. The top user made RMB 2,940 (~US$430) from sharing with 290 friends. 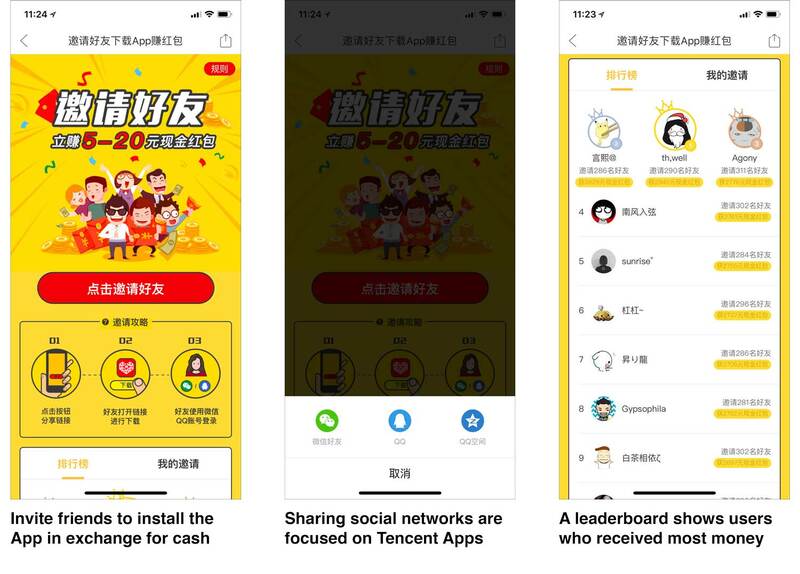 Many of us have thousands of WeChat friends, and it’s easy to imagine earning similar amounts from sharing on our Moments. One more viral mechanism from Pinduoduo is the use of lotteries. Typically, users have to pay a small entry fee (RMB 0.01) to get into a lottery. For the lottery to be active, they must also invite enough friends to join it within a specific period of time. If they get enough friends to join, users can then get a chance to win the product for only the entry fee. It’s also not clear how many users in total will join the lottery and what the chances of winning are. The interface is also tricky, as it looks like any other group-buy. And, if you don’t win the lottery, the app offers you a refund with a coupon to buy more stuff on the app. These are customizable messages that can be sent 48 hours after the user followed the account or interacted with it. Most of the accounts only use these messages to welcome users or for customer service requests. But Pinduoduo does more: they use these messages to continually recommend new products to the user. Unlike the “broadcast” messages that are limited (four per month for service accounts), these messages are unlimited, can be customized for each user, and are the perfect way to make recommendations based on order history. 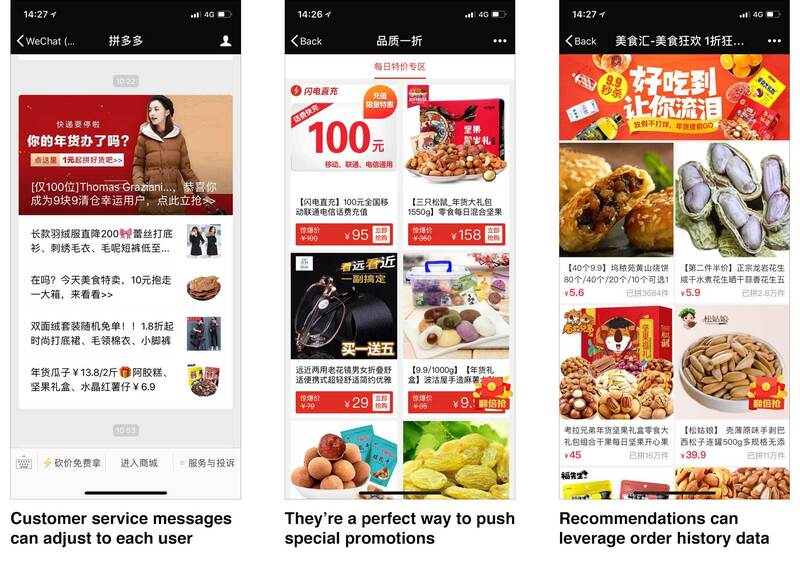 We received an average of five messages every 24 hours after subscribing, and these are very visible messages sent from a WeChat service account! 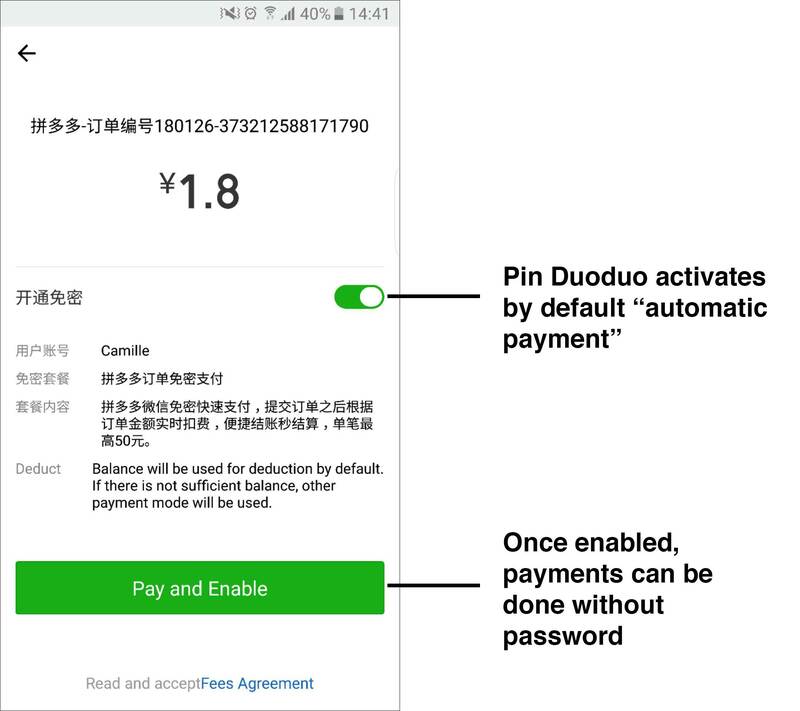 Moreover, if users click a menu item on the WeChat official account (for instance to check their order status), the 48-hour window is reopened and Pinduoduo can keep messaging them. The first time you pay, the app enables “password-less payments” by default. After this first purchase, you won’t have to enter your password anymore and will be able to do one-click payments. This is an amazing way to increase impulse purchases, which are the bread and butter of Pinduoduo. 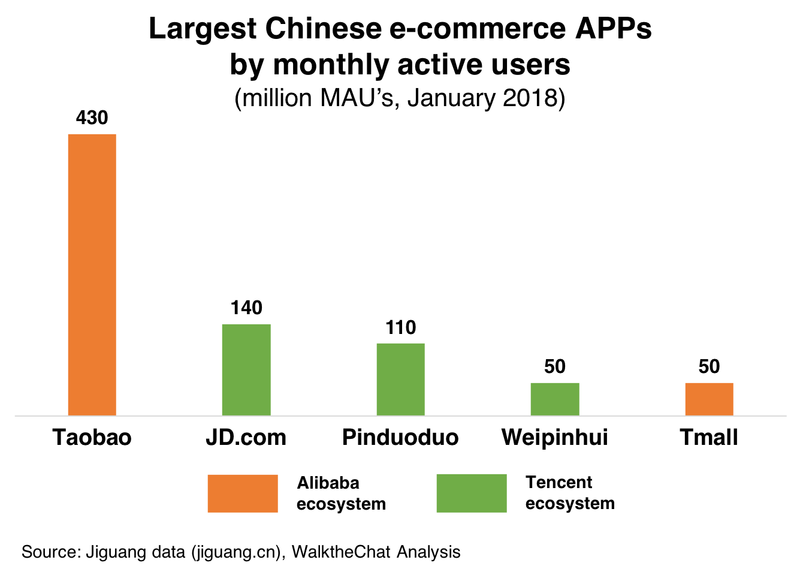 Ecommerce is hyper-competitive, especially in China. It is important for new players to stand out with unique offerings that attract customers, and Pinduoduo is one such case, crafting a convergence between social and commerce that discovers and capitalizes on a new source of user in lower-tiered cities. 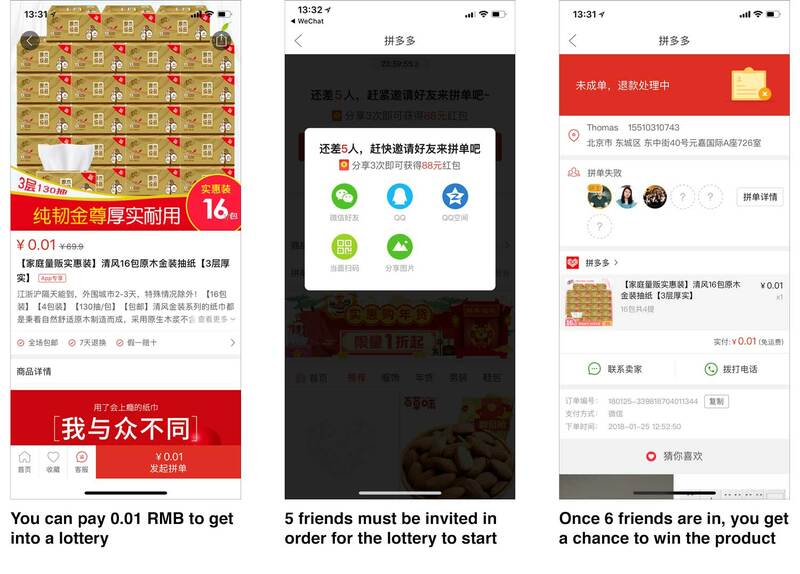 As internet access in China’s rural areas continues to improve, it is likely that the bargain hunting app will sustain growth as its service reaches remote areas. Although this trajectory is unique, a lot of brands and platforms can take cues from Pinduoduo’s success. By applying some of these tactics to your own business, you too can have more users with stronger levels of engagement. Converted from Chinese Yuan. Rate: US$1 = RMB 6.69. This article was first published on WalktheChat. This entry was posted in Digital Marketing and tagged digital marketing on July 19, 2018 by admin.